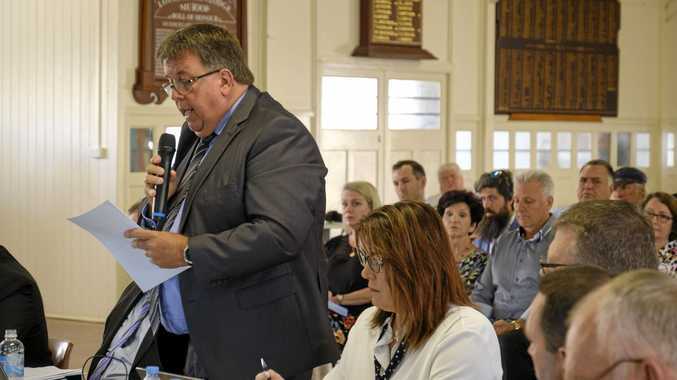 Police had to deal with a spate of violent incidents across the city. Picture: Bill Hearne. BOOZING sessions inspired by the Melbourne Cup appear to have spiralled out of control in Sydney overnight as wild brawls, a sickening baseball bat bashing and a number of assaults triggered of arrests. 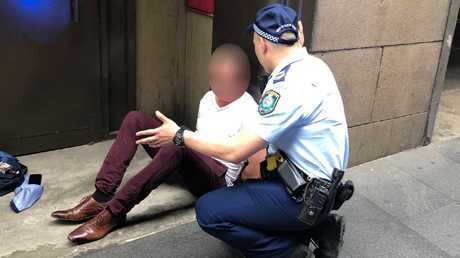 NSW Police confirmed this morning that three people have been arrested following drunken, violent incidents which left four people injured in the city's CBD. 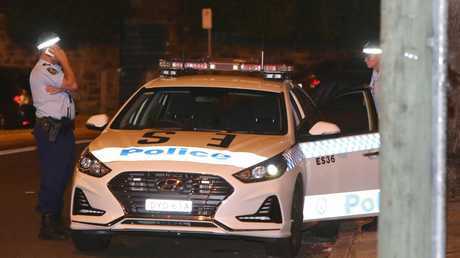 Cops say they were forced to intervene following two brawls at a licensed premises in the city overnight. One of those was a massive bar brawl at Merivale's Establishment Bar on George Street. Just before 10pm, police were called to the bar - owned by pub baron Justin Hemmes - after a fight broke out just outside the venue. Police allege a man and woman were speaking with three people before a fight broke out and bouncers tried to intervene. During the altercation, it is alleged, a 38-year-old man was punched in the face before falling to the ground unconscious and a 26-year-old woman was struck in the face with a plastic cup. The man was treated and taken to St Vincent's Hospital in a stable condition. The woman and a 39-year-old man were treated for facial lacerations and taken to Sydney Eye Hospital. A 33-year-old man and a 28-year-old woman were arrested and taken to Day Street Police Station, where they remain in custody. In a separate incident, it is alleged a man punched a 23-year-old woman in the face while police were still at the bar making inquiries. She was treated on scene by paramedics for facial injuries. A 38-year-old man was arrested and also taken to Day Street Police Station. He was charged with assault occasioning actual bodily harm and granted conditional bail to appear at the Downing Centre Local Court on December 5. 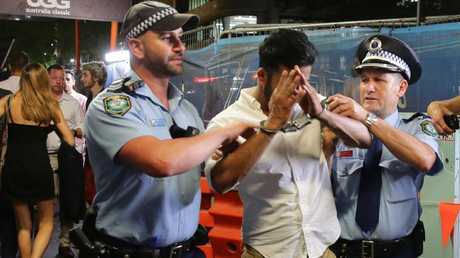 In an unrelated incident, two men allegedly assaulted the restaurant manager of the China Lane restaurant, Angel Place before moving 500 metres up the road and assaulting another man on Pitt Street. Officers were called to the scene at 4.45pm before arresting the men 10 minutes later on Pitt Street. Photographs from the scene show police talking to the men as they sat on the ground in the street before one of them was escorted towards a police vehicle. A Daily Telegraph journalist at the scene saw the action unfold - and said the men were swearing at police officers. "I'm f**king pissed mate. Honestly, you're f**king pigs," the man in a white shirt said to police, according to the Telegraph. The pair, aged 43 and 34 were each charged with assault occasioning actual bodily harm in company and intimidating police. The 43-year-old was additionally charged with two counts of assault. They were granted police bail to appear in court next month. 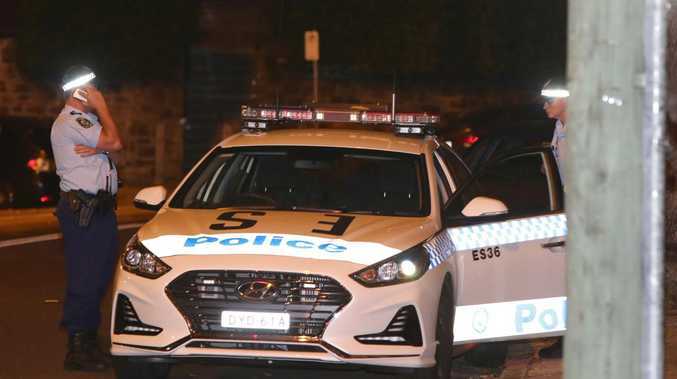 Police have appealed to the public for witnesses to come forward after two men were assaulted with a baseball bat at Bellevue Hill in the city's east overnight. At around 12.50am this morning a group of four men were walking west along O'Sullivan Road near Birriga Road - a spokesman NSW Police told news.com.au they had been out celebrating the Melbourne Cup. One man was walking on the roadway when a white hatchback drove past, narrowly missing him. A man has been transported to St Vincents Hospital with a head injury. Picture: Bill Hearne. It is then police say the pedestrian shouted at the driver who stopped the vehicle and reversed a short distance. The front seat passenger got out from the vehicle armed with a baseball bat. He approached the 28-year-old pedestrian and struck him in the head with the bat. When a 22-year-old man intervened, he was also struck to the left forearm. The armed man then returned to the vehicle and it drove from the area in a westerly direction along O'Sullivan Road. The alleged attacker has been described to police as being of Middle Eastern appearance and 180cm tall. He had a slim build with short dark hair and a short beard. The two injured men were treated at St Vincent's Hospital however their wounds are not considered serious. NSW Police could not say exactly how many arrests were made in relation to Melbourne Cup celebrations yesterday.